BOSTON, September 24, 2018 – The new report from IDTechEx Research, Drones 2018-2038: Components, Technologies, Roadmaps, Market Forecasts, provides a comprehensive analysis of the drone market, considering components, technologies, application roadmaps and markets. Sensors in drones: Two key trends are considered. The first is the evolution towards full beyond-line-of-sight autonomous navigation. The second is the evolution of drones well beyond just flying photography cameras. For the first trend, a roadmap is developed showing how the on-board sensors and the supporting infrastructure need to evolve to achieve full autonomy. To this end, also considered are IMUs, GPS, camera, infrared, ultrasound, radar and LIDAR sensors. For the second trend sensors such as thermal, multispectral, hyperspectral, gas and other sensors are covered. Software and analytics: Software and analytics are key to drones. In this study, three tiers of software are considered: flight control, mission planning & management, and data analytics. For each tier, the evolution of capability, covering the past, the present and the future is considered. For example, for flight control the report examines how the capability is evolving from basic remote-control towards full autonomous flight via see-avoid/track etc. The roadmap of software for each application sector is explored. Here too the past, the present, and the future are all assessed, outlining the software capabilities today and those of the future. The timelines involved reflect IDTechEx’s understanding of the technology and its challenges. Furthermore, the impact of open source and the recent partnerships in this landscape are examined. Regulation: The report provides a brief overview of the past and the present of regulation in key territories before offering insights into how the regulations might and should be evolved. Regulations currently impose many constraints on drones, shaping their potential market in various applications. Furthermore, technology capability is currently pushing ahead of regulation, therefore legislators worldwide have difficult calls to make to ensure the right balance between commercial interest, public safety and personal privacy. Applications: The report considers more than 12 drone commercial applications including agricultural, research & rescue, inspection, delivery/logistics, real estate, construction, people-carrying, etc. The readiness and hype level of each application is analyzed. We assess the drone's value proposition and challenges in each application. Furthermore, a roadmap is provided, outlining the status of drones in each sector today and considering its short-, medium- and long-term futures. 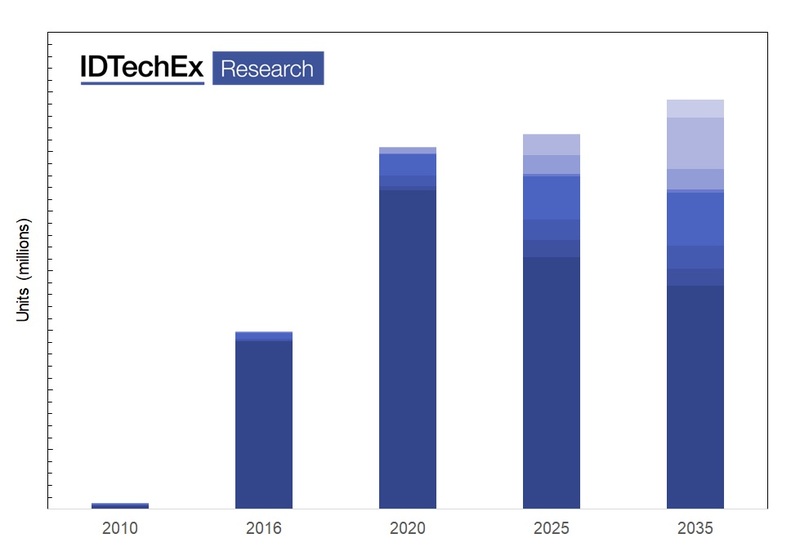 This analysis feeds into the timelines which IDTechEx use in their market forecasts. Company profiles: IDTechEx research is based upon extensive primary and secondary research. They interview many companies in the business. In this report, full profiles are provided for around 30 drone companies including Agribotix, Deadalean, TwingTec, Yuneec, UniFly, UAV Factory, Precision Hawk, Aerovironment, Autel Robotics, Ehang, Exyn technologies, Flyability, Parrot, DJI, Airware, 3D Robotics, Aeryon Lab, DroneShield, vHive, Hoversurf, Nightingale Security, Sky-Futures, OPTELOS, SiteAware, Kray Technologies, DelairTech, Mothership Aero.